Anusandhan Trust has instituted the Krishna Raj Memorial Lecture Annual Series on Contemporary Issues in Health and Social Sciences to honour the intellectual and academic traditions that Krishna Raj set in place, and in his memory. 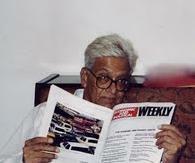 This is a humble tribute to the memory of the visionary editor of the Economic and Political Weekly (EPW). At Mumbai: Thursday, 27th September 2018 (2.00 pm to 4:00 pm) Venue: Jivraj Mehta lecture Hall (MLT), College Building, Seth GSMC and KEM hospital Parel, Mumbai 400012. At Mumbai, February 27, 2015. The Seventh Lecture of the Krishna Raj Memorial was on Rethinking Population Education: Challenging the Gender and Structural Violence of Prevailing Norms . The Sixth Lecture of the Krishna Raj Memorial was on Ethics of Public Health interventions: A view from the frontline. At Mumbai, January 5, 2011. The Fifth Lecture of the Krishna Raj Memorial was on Towards universal, comprehensive and equitable National Health Systems: The 22 Years Brazilian Experience in its context. At Mumbai, April 9, 2010. The Fourth Lecture of the Krishna Raj Memorial was on Equity and Health-Care in the Era of Reforms. At Mumbai, January 10, 2009. The Third Lecture of the Krishna Raj Memorial was on CliniCal Trials and HealthCare regulation in India. At Pune, March 18, 2008. Second Krishna Raj Memorial Lecture on Contemporary Issues in Health and Social Sciences, Social Programmes, and Poverty Reduction in India and Elsewhere.